FREE App -- An Easy Way to Get a Daily Dose of INSPIRATION for Leaders! Make 2017 your best year yet with a little coaching…every day. What if you could get clear and stay focused—all year long? 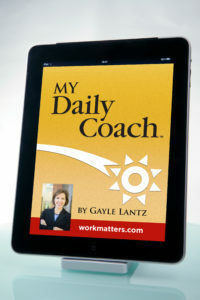 My Daily Coach is a mobile app designed for busy leaders who want to grow their business and themselves. Developed by Gayle Lantz, founder of WorkMatters, Inc., My Daily Coach helps you gain insight, prompt action and achieve results—one day at a time. Let Gayle guide you as you navigate your own path as a leader. A dose of inspiration and practical thinking each day will help you be most successful in your leadership role. Coaching in less than a minute a day goes a long way.